Many diesel generator shaft parts, such as crankshaft, camshaft, drive shaft and so on. The common damage forms of shaft parts are bending, wear and fracture. The axis of the shaft-like part must be in line with its axis of rotation, otherwise the shaft is bent and deformed. As shown in FIGS. 2-9, the axis before the shaft 1 is not bent is AA, and the axis after bending is BB. When the bending degree of the shaft is checked, the contact of the differential table 2 is generally used against the central part of the shaft 1 (if the crankshaft or the camshaft journal is singular, the intermediate journal can be measured; if the journal is double, the middle two journals should be measured and the maximum value is taken), and when the rotating shaft is rotated, The difference between the maximum reading indicated by the long pointer of the differential table and the minimum reading, that is, the amount of runout of the shaft on the radial circle. For some simple shafts, they can be rolled directly on the flat plate. When rolling, the light leakage between the shaft and the plate can be observed, according to which the bending of this kind of parts can be judged. The shape of shaft-shaped parts is more complicated, some are curved crank (such as crankshaft), some are tubular (such as half shaft sleeve), some are rod shape (such as steering pin), and the parts of wear and tear are axle neck. Figure 2-10 measures wear of crankshaft connecting rod journal. One half of the maximum value of the difference measured on the same cross-section is roundness, and one half of the maximum value of the difference measured on the same longitudinal section is the cylindrical degree. The length of the journal and radius of the circle should also be checked when one or both ends of the journal have shoulder face bearing thrust. In order to improve the inspection efficiency, the wear quantity of axle neck can be measured by various special limit gauges in the repair unit with single model and large production scale. It can be checked by inspection method and detection method. 1. The lubricating oil in the oil pan is insufficient or the oil line is not smooth, the engine oil pump can not supply oil normally or the lubricating oil pressure is too low, which leads to poor lubrication. 2. The grade of lubricating oil does not meet the requirements, the lubricating oil is spoiled, too dirty; the waterproof rubber seal ring of the cylinder liner fails, resulting in the leakage of cooling water to the oil pan. 3. The clearance between the journal and the bearing is not up to standard. The gap affects the formation of lubricating oil film; if the gap is too small, the lubricating oil is not easy to enter the friction surface of the journal and the bearing, and can not form the lubricating oil film; if the gap is too large, the vibration and impact between the journal and the bearing are increased, resulting in the film rupture of the lubricating oil. 4. 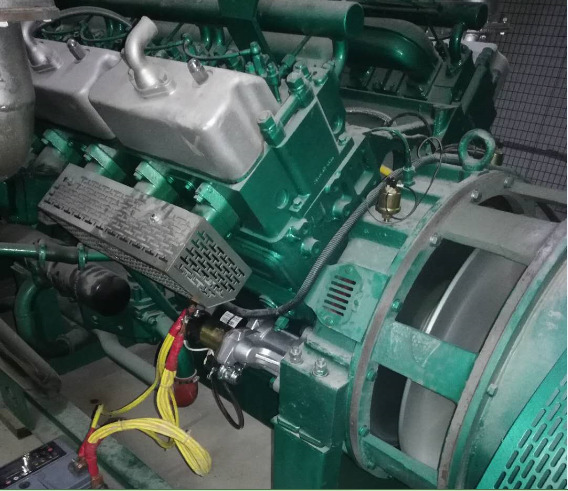 When the diesel generator has just started, especially in winter, when the lubricating oil has not been fully lubricated, it should work at a very high speed and full load, or start frequently, run at idle speed for a long time, etc. 5. The diesel engine is overloaded for a long time and overrotating speed: the temperature of the body is high, the viscosity of lubricating oil is decreased, the normal lubricating oil film is not easy to form, the alternating load and the working cycle exceed the material limit of the bearing liner; Load fluctuation or increase in fluctuation, resulting in oil bubble rupture. 6. Improper maintenance and assembly, flange on the journal surface, and uncleaned assembly. While troubleshooting the parts themselves, special attention should be paid to finding out and analyzing the causes of the failure, such as whether the failure of the bearing bush is due to low lubricating oil pressure, lack of lubricating oil, or dirty blockage of the oil channel and poor flow of oil, etc. Only when the ultimate cause of the fault is found and eliminated, can the diesel generator work reliably, so as to avoid the similar faults occurring again after the replacement of the bearing bush.